Selected Science News: CLOSING IN ON DARK MATTER? Physicists have long theorized the existence of dark matter, arguing that it is a kind of hidden cosmic glue that helps to hold galaxies together. But detecting it has proven extremely difficult because the particles do not absorb or reflect light, and interact very weakly with other particles. 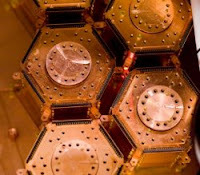 In a presentation at the Fermi National Accelerator Laboratory in Batavia, Ill., scientists from the Cryogenic Dark Matter Search (CDMS) experiment announced the two new potential detections in data taken in 2007 and 2008. However, they cautioned that both events could be the signatures of background particles — other particles with interactions that mimic the signals of dark matter candidates. “The results of this analysis cannot be interpreted as significant evidence for (dark matter) interactions, but we cannot reject either event,” said Lauren Hsu, a Fermilab CDMS researcher who presented the results. MIT Assistant Professor of Physics Enectalí Figueroa-Feliciano, a member of CDMS, and his group members have been involved in operating the experiment and analyzing the data. Caltech researcher Fritz Zwicky first proposed dark matter in the 1930s as a way to explain discrepancies between the inferred mass and the light output of a cluster of galaxies. Other observations also suggest the existence of dark matter. The speed of stars in the outer reaches of spinning galaxies allows astronomers to calculate the amount of mass that must be in those galaxies, according to accepted gravitational theory. However, there isn't enough visible matter in those galaxies to produce the necessary gravitational pull, so physicists theorize that dark matter makes up the difference. The only alternative would be that there is something wrong with the theory of gravity, as formulated by Isaac Newton and refined by Albert Einstein’s theory of relativity. Some physicists have come up with alternative theories of gravity to explain the discrepancies, but these have not been widely accepted. The detection of dark matter, if confirmed, could solidify the case for the present theory, says Paul Schechter, MIT’s William A. M. Burden Professor of Astrophysics and an observational astronomer who studies galaxies and clusters of galaxies and the distribution of dark matter therein. Many particle physicists believe that dark matter is composed of Weakly Interacting Massive Particles, or WIMPs. These particles are difficult to detect because the likelihood of their interacting with protons and neutrons is very small. However, they may occasionally bounce off an atomic nucleus, leaving a small amount of energy that is detectable under the right conditions. Those rare interactions can be easily masked by neutron collisions, which occur far more frequently and produce a similar electronic signature. Gamma rays can also produce background interactions. To minimize background, the CDMS experiments are located half a mile underground at the Soudan mine in northern Minnesota. The CDMS experiment, which has been searching for dark matter since 2003, consists of 30 detectors made of germanium and silicon, cooled to temperatures very near absolute zero. Particle interactions in the crystalline detectors deposit energy as heat and as charges that move in an applied electric field. Special sensors detect these signals, which are then amplified and recorded for later study. By comparing the size and relative timing of these two signals, experimenters can distinguish whether the particle that interacted in the crystal was a WIMP or a background particle. Due to the size of the data set from 2007 and 2008, five events would be necessary to claim that dark matter had been detected. With only two events found, there is about a one in four chance that these could be background signals. Therefore the CDMS experimenters do not claim to have discovered WIMPs. However, the fact that more possible signals weren’t seen does set upper limits on the mass of dark matter particles, which can already rule out some proposed theories of their nature. CDMS experimenters, including Figueroa’s group at MIT, are now working on larger detectors, expected to be in place by next summer, that will be able to gather three times as much data in a given time period and thus could produce compelling evidence for dark matter. MIT Assistant Professor of Physics Jocelyn Monroe, who is involved in two other dark matter detection projects but not CDMS, calls the new data from that experiment “intriguing,” and says this is “probably not a significant or conclusive detection, it’s more like a tantalizing hint.” One of the new detectors, called miniCLEAN and being built in Ontario, Canada, should be able to see somewhere between 20 and 100 events per year if the CDMS detection really was dark matter, she says.